The Toei One-Day Pass, priced at only 700 yen, allows unlimited rides on the Toei subway, Toei buses, and the Tokyo Sakura Tram. 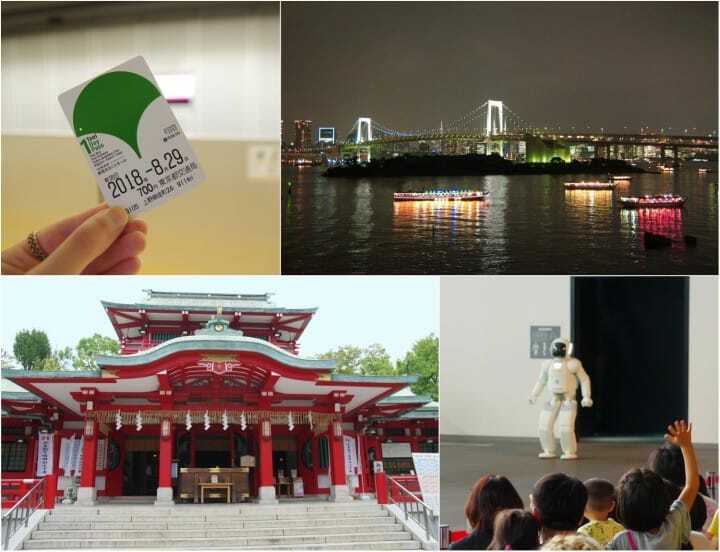 Using this pass, I visited the charming area of Monzen-nakacho and then the modern entertainment district of Odaiba! As one of the world's largest cities, Tokyo is the definition of a truly dynamic metropolis, containing endless neighborhoods to explore and learn about. Using the convenient Toei One-Day Pass, I went to two areas of Tokyo unfamiliar to me: Monzen-nakacho area, full of charm with historical shops and shrines, and Odaiba, a modern and exciting entertainment area surrounded by the scenic Tokyo Bay. This article details my journey around Tokyo using the Toei One-Day Pass. In order to make the most of my day, I headed to Ueno-okachimachi Station on the Toei Oedo Line in the morning. The station is conveniently located to JR Ueno Station and near to many well-known sightseeing spots, like Ueno Park. Go underground and find the digital ticket vending machine. Next, set the display to English, and touch the "Value Ticket" option. The Toei One-Day Pass is 700 yen for adults and 350 yen for minors. Your ticket should look like this! This ticket is very convenient and usable for all Toei Subway lines, Toei buses, and the Tokyo Sakura Tram and Nippori-Toneri Liner. It is a very budget-friendly pass as you can use a combination of transportation methods to travel throughout all of Tokyo! After getting the ticket, use the one-day pass to go through the subway gates and ride the train for Hikarigaoka for 11 minutes. Get off at Monzen-nakacho Station, our first destination. After arriving in Monzen-nakacho, I first headed for Ninjo Fukagawa Goriyaku-dori (Fukagawa Fudoson Shotenkai), a shopping street with a retro feel, unique to the historical downtown Tokyo area. I found many charming shops selling Japanese items that I was tempted to pick up for gifts, as well as a number of specialty wagashi (Japanese sweets) stores and cafes. In particular, Fukagawa Iseya, a Japanese confectionery in Tokyo that started business over 100 years ago in the Meiji era. There are several other locations throughout Tokyo, their main store is in Monzen-nakacho. After chatting a little with the shop owner, I decided on the Fukagawa Roman, a popular Western-style cookie at Fukagawa Iseya, and the shio daifuku (Japanese dessert made of rice flour and red bean paste). The cookie has caramel in the center and makes the perfect snack if you're feeling a little hungry. I also enjoyed the shio (salt) daifuku, which was one of the most fresh-tasting, high-quality wagashi I've tasted in Japan. In addition, there are many other Japanese-style sweets available, including the yaki dango (roasted buns) in the picture above. My next destination is Tomioka Hachimangu Shrine, a Shinto shrine that dates back to the Kan'ei era (1624—1644). As such, the shrine holds a lot of history and has played a large role in the development of this part of Tokyo. Each month there are various events and festivals held here as well. This shrine is dedicated to Hachiman, guardian deity of warriors. In the early Edo Period (1603-1868), it was the first shrine to be granted permission to hold sumo wrestling events. Close to the honden (main hall) you will find a digital display with English where you can learn more about the shrine and the proper way to pay your respects. If you want a memento from your visit to Tomioka Hachimangu Shrine, be sure to look at the omamori (charms or talismans), which are thought to bring you luck or help your wish come true. I bought a ginkgo leaf-shaped charm (800 yen), unique to Tomioka Hachimangu Shrine to help my relationships and make new connections. 2. Monzen-Nakachō bus stop on bus lines 都7 (To 07) and 東22 (Higashi 22). After exploring Monzen-nakacho, I went to the bus stop to start the next phase of my trip to Odaiba. Return to the main street and walk back towards the subway station on the covered sidewalk along the main street, Eitai-Dori. You can recognize the station by its mark - a green Ginkgo leaf. Within the Toei Oedo Line Monzen-nakacho Station, there is a very useful digital signage bus route information board. It offers information on the buses that leave from Monzen-nakacho, so you can check what bus you should take to reach your destination and which platform should you use. When you arrive at the station, it might be a good idea to check this digital board. The bus heading to Odaiba departs from stop 5. Make sure you are on the route 海01 Toei Bus. The bus is green and orange in color and should be going towards Tokyo Teleport Station. There is also English signage at the stop and on the bus which you can check. I took the 12:02 bus. Enter in the front and simply show the bus driver your Toei One-Day Pass so that they can see the date of the pass. The bus might sway so take an available seat or hold onto a pole or handle to stabilize yourself! The following bus stops and other useful information are displayed on a monitor in the front in English, so you don't have to worry about missing when to get off. Our stop is Nippon-Kagaku-Miraikan Mae, which takes around 34 minutes to reach. This scenic route goes over water around Tokyo Bay and is quite relaxing. After getting off, you will be right in front of Miraikan - The National Museum of Emerging Science and Innovation, one of Tokyo's leading science and technology facilities. Miraikan - The National Museum of Emerging Science and Innovation is a science and technology facility showcasing and connecting science to everyday life. In addition to permanent exhibits, there are also special exhibits, educational events and conferences, and a theater. Upon entering the Miraikan, I was greeted by the impressive Geo-Cosmos, a giant globe constructed from 10,362 panels using OLED technology. Throughout the day Geo-Cosmos shows different displays, including the atmospheric movements of the Earth. Miraikan was unlike any other museum or science building I had been to before. Rather than static displays of information, the exhibits here are engaging and entertaining, striving to further connect science and technology to everyday life. Another goal of Miraikan is promoting sustainability. As such, a number of exhibits pose questions about the future safety and state of the Earth. I personally recommend trying the Backward from the Future on the third floor, where you select a message to send to the future via a giant video game-like screen. You can also see ASIMO, the adorable robot designed by Honda, in action here. Four times a day there are ten-minute shows where ASIMO will walk around and perform for you. The show is in Japanese and English. There is also a restaurant and a cafe if you are hungry. I stopped at the 7th-floor restaurant, Miraikan Kitchen, which is a spacious and modern restaurant with a self-serve system. While dining here you can look out the window and enjoy the view of the landscape outside. For dessert try the Monaka Wafer Globe Soft-serve ice cream, featuring an Earth-pattern wafer with ice cream inside. You can choose from matcha (green tea), vanilla. or a mix of both flavors (shown above, 380 yen). After an entertaining and educational afternoon at the Miraikan, I went to the bus stop on the opposite side of Miraikan, using the same #1 bus route. To get to my next stop, the Fuji Television building, I rode the bus in the opposite direction, heading back towards Monzen-nakacho. Ride the bus for just three stops and get off at Fuji-Terebi (Fuji TV) bus stop. Once you get off, the iconic Fuji Television building with its unique metallic, spherical appearance, will come into view from across the street. Fuji Television Network is a major broadcasting company, responsible for popular Japanese animations and shows like "One Piece" and "Chibi Maruko-chan." The first floor of this building is home to shopping malls and galleries where you will find Fuji Television-related merchandise and dining establishments. The 25th floor of this building is the iconic sphere, which is an observatory you can enter called Hachitama. At the information booth located next to the escalator, you can purchase a 550 yen ticket to get panoramic views of Odaiba and Tokyo Bay. Unfortunately, the sky was pretty cloudy and hazy at this point in my day. However, I still was able to get a nice view of the symbolic Rainbow Bridge and make out Tokyo Tower. After visiting the Fuji Television building, I headed for Odaiba Marine Park, which is a park along the water, just a short walk away across the street. As you stroll along the park path you will get a beautiful view of the Tokyo cityscape, including Rainbow Bridge. You will also come across an interesting landmark here: a replica Statue of Liberty, which is 1/7th the size of the statue in New York in the United States. My last stop was at Frame cafe located inside Tokyo Joypolis, an entertainment facility next to Odaiba Marine Park. In order to enter you need to pay an admission fee. Admission is 800 yen for adults, 500 yen for children age 17 and under, but if you have a non-Japanese passport you can receive a 300 yen discount. After paying, I headed for the cafe! Frame cafe is a relaxing space on the third floor where you enjoy a coffee and food. It is also known for having one of the best views of Rainbow Bridge and the Tokyo Bay in Odaiba. I was very happy to find the menu at Frame cafe vegetarian-friendly. I ate a tasty bean and vegetable-based curry dinner outside with the refreshing breeze coming from the bay. Before heading back, I walked outside one more time for an evening stroll in Odaiba Marine Park. The cool bay breeze in the evening combined with the illuminated Rainbow Bridge makes is a great way to end the day. When I was finished walking around the park, I headed to the Odaiba-Kaihin-Koen Ekimae bus stop (in front of Odaiba Marine Park Station) to go back to Monzen-nakacho. After my long day, the bus ride back was very relaxing. The nightscape on the route back featured many offices and apartments were illuminated in a slightly romantic way. My journey today took me through two very different parts of Tokyo, with historical Monzen-nakacho and the futuristic Odaiba area. The Toei One-Day Pass was a great chance for me to encounter unique areas in Tokyo and have an exciting and satisfying holiday.